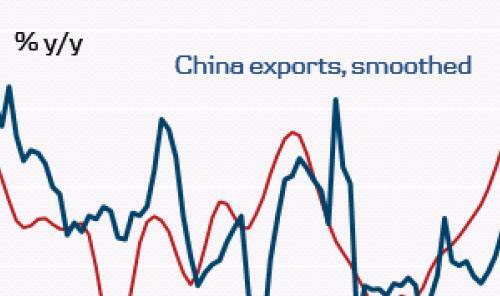 Foreign sales in China rose 15.6% y/y in October (estimate 11.7% y/y), pointing to still robust sales. However, it is likely this was due to front-loading of US imports from China ahead of the possible rise in tariffs from 10% currently to 25% from 1 January 2019. Hence, the impact of the trade war is probably strong Q4 exports but a big plunge in Q1. SCMP published a good article earlier this week. The PMI export orders index released last week pointed to a big fall in orders (see chart below). This supports the picture that overall exports are taking a hit but some orders been brought forward. The picture is similar for imports. They were stronger than expected but it is likely this was due to high import content in exports, which means stronger exports automatically lead to higher imports as well. However, if tariffs do increase, the decline is likely to be even bigger. Overall, we look for more short-term weakness in China but a bottom in Q1/Q2, as stimulus kicks in further and expected trade talks possibly lead to less pessimism among households and companies. We see a 60% probability of a ceasefire in the trade war when Xi Jinping and Donald Trump meet on 1 December. If there is a ceasefire, we expect the tariff rate to stay at 10% rather than increasing to 25%. However, the decline in exports is likely to come anyway, because the current front-loading would still leave an air pocket in Q1. The short-term economic weakness is likely to put continued downward pressure on the CNY, not least in Q1, when the slowdown is set to intensify. We continue to look for USD/CNY to move to 7.20 in 12 months, partly because we expect the Fed to keep hiking.